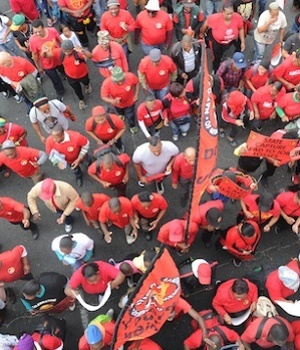 South Africa's largest trade union federation Cosatu is gearing up for a national strike, with protests planned in all nine provinces over the coming weeks. The national strike against job losses and unemployment will include protests in all provinces expect the Western Cape on Wednesday February 13. Protests in the Western Cape will take place on February 19 - the day before Finance Minister Tito Mboweni is expected to deliver his maiden Budget speech. Union members plan to march to government buildings and the offices of major companies and state-owned entities, while in the Western Cape a march has been planned to Parliament. "The preparations for the strike against job losses are in full swing and the workers stand ready to fight and defend their livelihoods," said Cosatu in a media statement. "Currently, the real unemployment rate is 38%, with close to 10 million people struggling to get jobs and over 17 million on welfare." The federation said its campaign would link to demands for redistribution of wealth, state intervention and a moratorium on all retrenchments. "Market-driven reforms that have been used since 1996 have clearly failed and thus an interventionist state is needed to transform the distortions of our apartheid capitalist economy." The union reiterated calls to Mboweni to reduce the VAT rate that his predecessor Malusi Gigaba hiked by 1 percentage point at the last Budget, calling it a strain on the poor. It also called on the state to announce a wealth tax and boost the corporate tax rate to "ensure the rich pay their fair share". The federation said workers were angered by the "constant flood of rumours of mass looting and corruption" at state-run asset manager the Public Investment Corporation, which manages over R2trn in state pensions. This comes amid a judicial commission of inquiry into how investments were made at the corporation. On Friday the PIC's board resigned en masse. "This is their money and it should not be used to enrich morally vacuous politicians, their parasitic relatives and obnoxious business people."